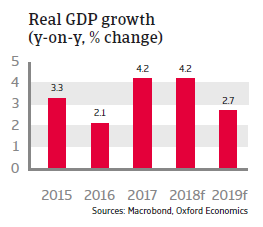 After increasing 4% in 2018 GDP growth is expected to decelerate to below 3% due to lower household consumption and less investment and export growth. The ruling conservative coalition of the Fidesz and KDNP parties under Prime Minister Viktor Orbán has repeatedly taken actions that led to confrontations with the EU commission and its EU peers (e.g. a controversial media law, some constitutional amendments curbing judicial independence, a tough stance in the migrant policy and a pro-Russia stance. 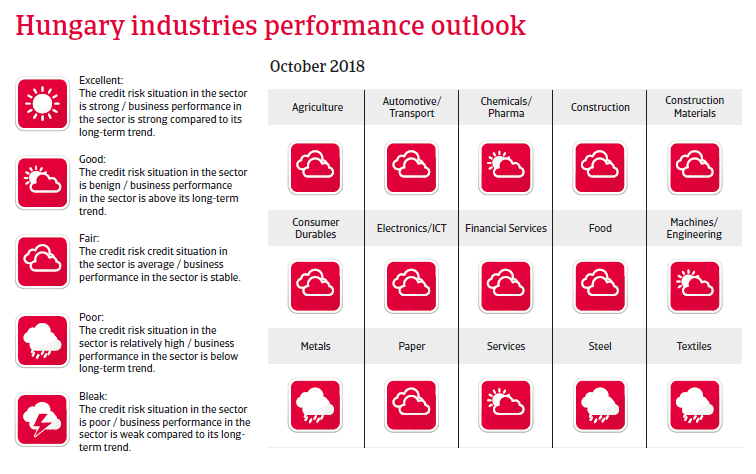 Together with some unorthodox economic policy decisions like additional taxes on banks, the government’s repeated confrontations with the EU have led to some uncertainty among its European peers and international investors in the past. In the April 2018 general elections the coalition government won again, and with its two-thirds majority in parliament it can alter the country’s constitution all by itself. In 2017 economic growth increased more than 4% as private and public investment accelerated , while private consumption and export remained robust. This momentum has continued in 2018, with growth in private consumption driven by rising wages (minimum wage increases in 2017 and 2018) and increasing employment, while investment remains solid. 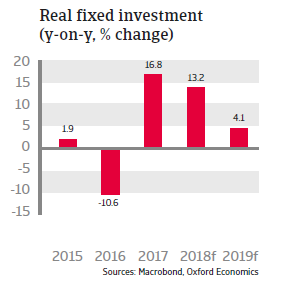 However, in 2019 growth is expected to decelerate to below 3% due to lower household consumption and less investment growth. Consumer prices started to rise again in 2017, and are forecast to increase above 3% in 2018 and 2019. Containing the budget deficit to 3% of GDP is a top priority of the administration in order to avoid EU sanctions. However, since 2010 the government has been using unorthodox ways to balance the budget, most notably extraordinary taxes on banks and utilities. The budget deficit is forecast to increase in 2018 due to lower corporate taxes and social security contributions and VAT decreases. Despite annual decreases, public debt remains high at more than 70% of GDP in 2018 (Central-Eastern Europe median is 52% of GDP). Hungary’s major weakness remains its high level of external debt (almost 100% of GDP in 2017), although it is expected to decrease in 2018 and 2019. A large share of this debt is foreign currency-denominated, which exacerbates the problem, as a sharp forint depreciation would hurt many Hungarian households and businesses whose loans are denominated in foreign currencies. Additionally, more than 30% of public debt is denominated in foreign currency. Despite the fact that current account surpluses bolster the exchange rate, the forint remains highly vulnerable to international investors’ sentiment due to the elevated external and public debt levels and a suboptimal institutional and policy environment. 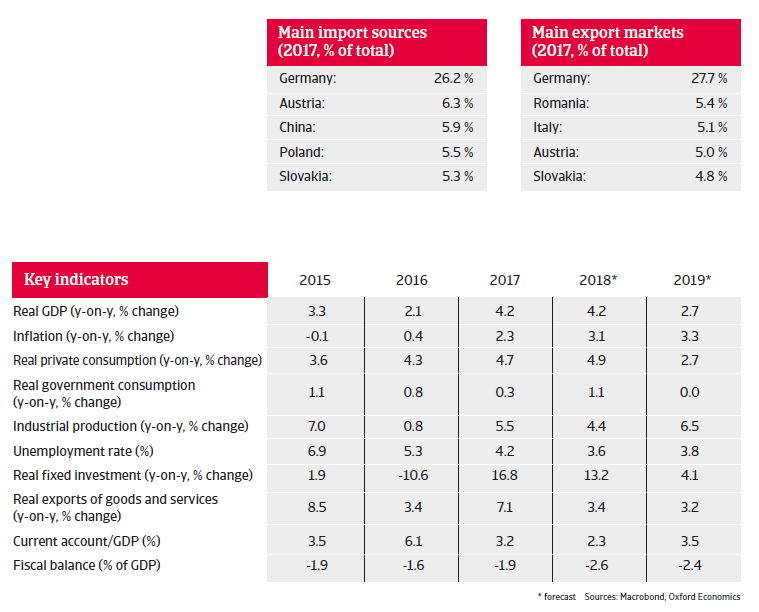 Additional risks stem from lower eurozone demand and a cooling down of world trade, which would hurt Hungarian export growth. Having drawn from the expertise of Atradius Collections' local offices, the International Debt Collections Handbook explains the different regulations and procedures for debt collections in Hungary. Pound sterling depreciation in the aftermath of the Brexit referendum in June 2016 has had significant impacts on UK-EU trade flows.